The world's oldest beaded jewellery has been found in caves in Israel and dates back 100 000 years. 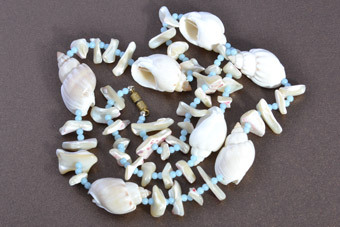 These primitive shell beads are proof that man has always had a desire to collect and adorn himself with beautiful objects. In pre-historic times, any symbolic bits or those deemed attractive, including bones, shells, teeth and stones, would have been attached to fibers and worn as jewellery. 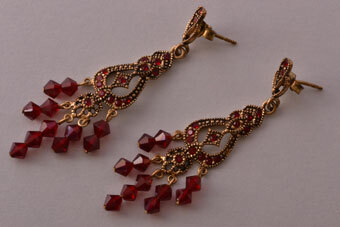 These would have served as a talisman either to protect the wearer from evil or to bring good luck. Beads have long been considered a symbol of status and wealth and in ancient times they were traded as currency and also worn simply for aesthetic purposes. Many of the world's oldest glass beads have been found in Mesopotamia and beaded jewellery has also been discovered in the tombs of Pharoahs. The Egyptians are famous for their love of beads which they used to adorn everything from their sandals to their clothing. They created a huge variety of beads from a range of materials and this meant that virtually all Egyptians could decorate themselves with them. However, only the wealthy could afford the beads made from precious stones like lapis lazuli. China is another civilisation that used beads extensively and experimented with different materials and techniques. The use of beads in Africa can be traced back for centuries and they were worn by both men and women as a sign of prosperity and social standing as well as an indication of the tribe that the person belonged to. 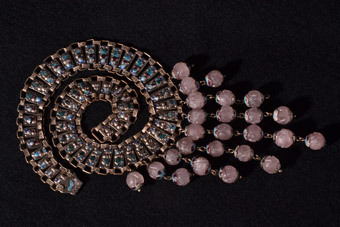 Colour played a significant role in the way beaded jewellery was put together - as various shades held different meanings. In Ghana, for example, white symbolised fertility, blue respresented purity and gold was used to display wealth. Beads are one of the most popular materials used to make jewellery because they come in such a huge array of shapes, sizes and colours. These versatile accessories are made from so many things including precious stones etc. 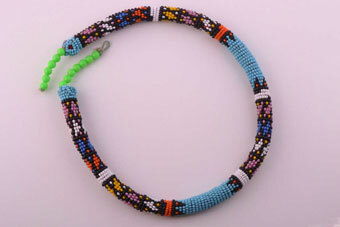 They can be created in all the colours of the rainbow, which means that there is beaded jewellery to suit every taste. They can also be simple, durable and inexpensive or ornate, fragile and pricey. Beads are as popular now as they've always been and they will continue to play a pivotal role in the creation of all different types of jewellery.